Even though it’s 70 degrees in LA, I’ve got fall fever! I love all the different types of apples available this time of year and using them in savory dishes. 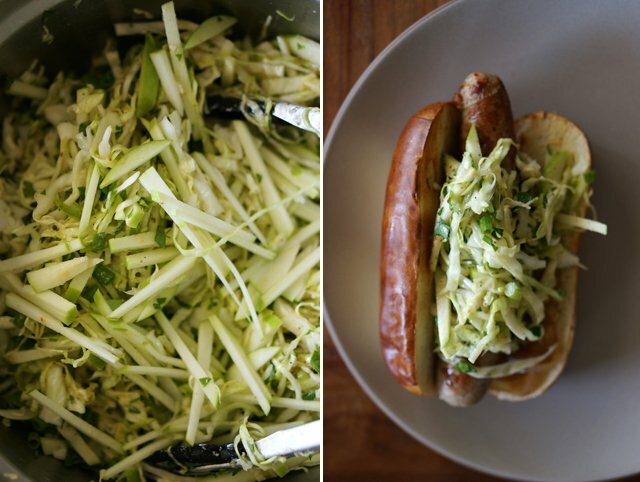 This light and tangy slaw incorporates sour green apples and grainy mustard, the perfect accompaniment to beer and sausages. 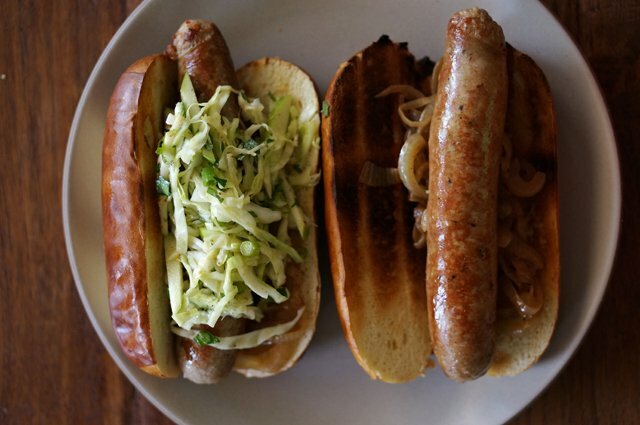 Beer-braised bratwurst is a dish that I make often on a weekday because it’s so easy. 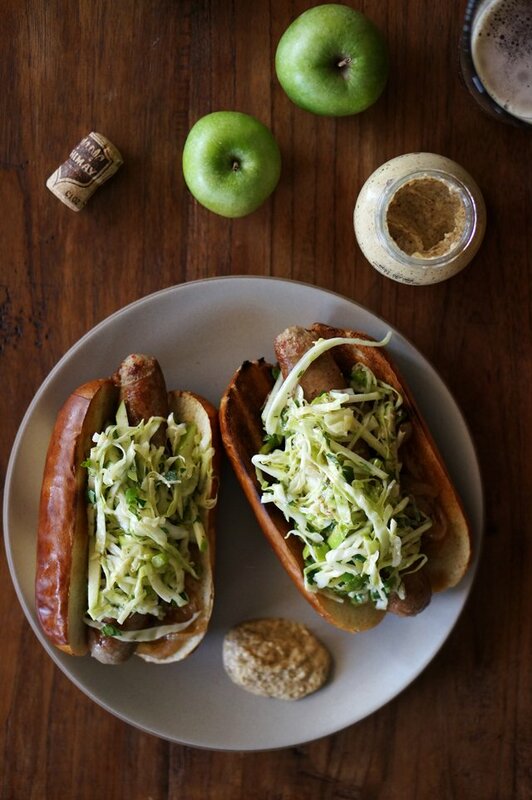 Smother it all in grainy mustard and you’ve got the perfect fall dinner! 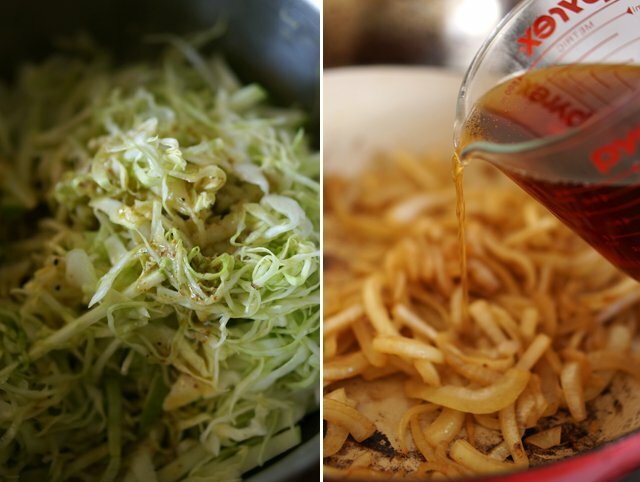 First, make the slaw by sprinkling a pinch of salt over the cabbage. 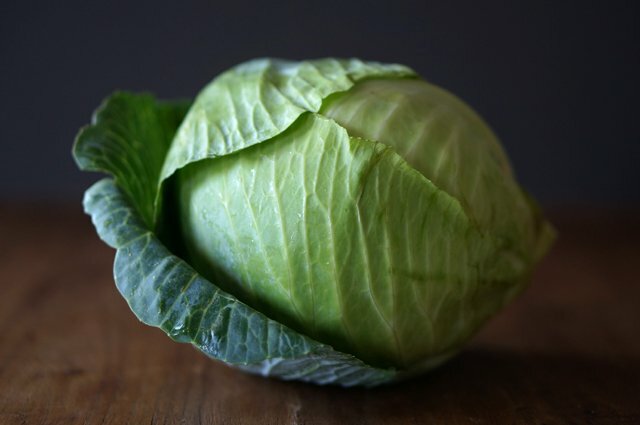 Using your hand, gently massage the cabbage for about a minute to soften the cabbage a bit. 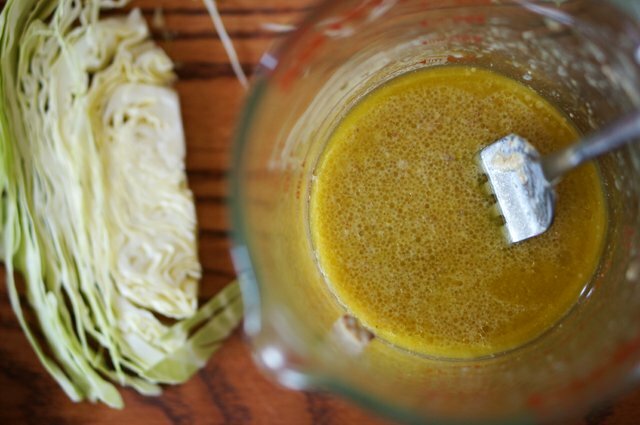 Make the vinaigrette by whisking the lemon juice and apple cider vinegar together while streaming in the extra-virgin olive oil. Stir in mustard and salt and pepper to taste. Add flat leaf parsley, apples and green onions. Dress the cabbage and set aside. To make the bratwursts, heat a pan with a little vegetable oil over medium high heat. Brown the sausages. Remove sausages and saute onions until softened and just starting to brown. Deglaze the pan with the beer scrapping up the brown bits on the bottom of the pan. Turn the heat down to simmer and place sausages back in the pan nestled in the onions. Cover with a lid and cook for another 5-7 minutes until the sausages are completely cooked through. Place some of the caramelized onions on a bun– or pretzel bun! 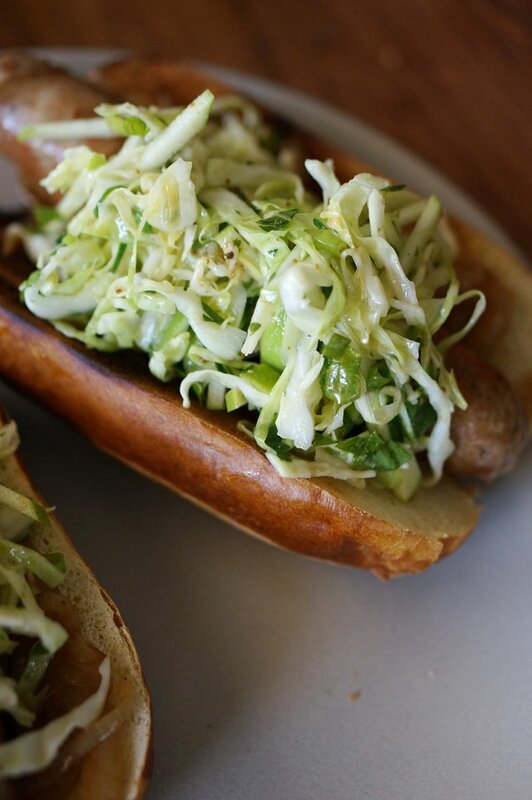 Top with apple mustard slaw and enjoy with more mustard on the side and a pint of beer! Great recipe! I added some caraway seeds to the slaw for a little extra zing. Yum! I know spring- or bunch onions (they look like tiny leek). Is that what you meen by green onions? This looks sooooo good. It is definitely autumn in the Netherlands. Yes! Would love to come home to this smell. From one Karen to another…this looks incredible! SO trying this. Pinned! What a great recipe, and surprisingly fast too! I ended up using Irish bangers since that was what was in my fridge and it was perfect braised in the beer. I really loved the flavor profile that all the elements bring together. I found the dressing quite a bit tart for my taste though, so next time I would use maybe only 3-tbsp of vinegar/lemon juice total. A pinch of sugar helped to even out the acidity this go-around. I’m sure this will be a standard fall meal for us! Glad to hear! I love my salad dressings sour so I can imagine it may be too tart for some, but glad you adjusted to your own taste. Mmm, I love brats! Thanks for the recipe, I’m definitely going to have to try these. My husband would beg for these! We’re enjoying great fall weather here in Virginia. And that slaw – yum! YUM – this is perfect for anytime of the year as far as I’m concerned. Looks delightful. Yes please! I love meals like this. They just scream fall. And I’m with you- I love using apples in savory dishes this time of year as well. Of course, I always have to have a little apple crisp, too! Looks outstanding. What kind of beer did you use? Thanks Neal, I used Chimay. That slaw looks awesome. Going to have to make that. The ultimate tailgating/Fall dinner! We spent a lot of time in Chicago when I was a kid, and brats there are like religion. I love the apple slaw here with grainy mustard, yes please. Thanks Ruthy. Brats are my #1 sausage of choice!